It’s July 2nd — Happy Half New Year! July 2nd marks the midpoint of the year — with 182 days preceding and 182 days to follow. Half New Year reminds us to consider what has occurred during the year as well as give thought to our hopes for the months ahead. As we ponder finished and unfinished business, opportunities taken and those missed, words spoken and those left unsaid, it’s reassuring to remember that we still have half a year to move closer to what brings us joy and fulfillment. Cheers! SOURCE: An earlier (and longer) version was published in Of Sun and Sand by Kind of a Hurricane Press in 2013. PHOTO: Little Girl’s Shoes, Ocean Isle Beach, North Carolina (photo by Beth Copeland). NOTE FROM THE AUTHOR: On a visit to Ocean Isle Beach in North Carolina, I was looked for shells and found some abandoned shoes a little girl had left in the sand. I wondered about the child the shoes belonged to. Why did she leave them? Was she sad that she’d lost her pretty gold shoes? I took a photograph of the shoes and later wrote the poem. ABOUT THE AUTHOR: Beth Copeland’s second book Transcendental Telemarketer (BlazeVOX books, 2012) received the runner up award in the North Carolina Poetry Council’s 2013 Oscar Arnold Young Award for best poetry book by a North Carolina writer. Her first book Traveling through Glass received the 1999 Bright Hill Press Poetry Book Award. 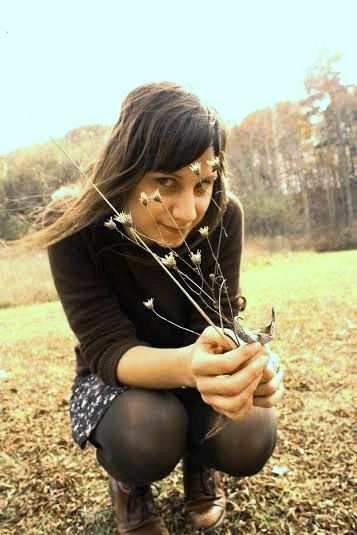 Her poems have been published in numerous literary magazines and anthologies, including The Atlanta Review, New Millennium Writings, The North American Review, Pirene’s Fountain, Poet’s Market, Rattle, The Southern Poetry Anthology, Tar River Poetry, and The Wide Shore: A Journal of Global Women’s Poetry. She has been profiled as poet of the week on the PBS NewsHour web site. Copeland is an assistant professor of English at Methodist University in Fayetteville. She lives in a log cabin with her husband in North Carolina. to go we knew not where. and then we heard a sound. as we two looked around. A shadow moved along the ground. The wings were cumbersome but strong. in story, poem or song. or keep it under wraps? who also might have seen. with child, adult, and teen. back burners or some shelves. or not–that had caught our eye? 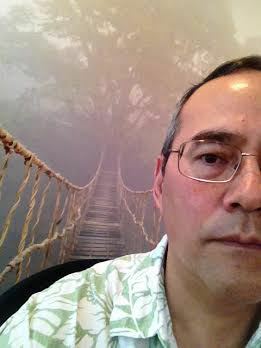 NOTE FROM THE AUTHOR: My creative process is like a jig-saw puzzle, putting together a bit of this and that. This poem is based on many hikes in the Pennsylvania woods and one of my favorite poems, as a child, “The Family Dragon,” found in The Children’s Hour, Best Loved Poems (1953). IMAGE: “Dragon” by Opal Arts. Prints available at etsy.com. 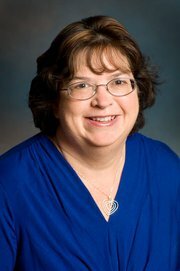 ABOUT THE AUTHOR: Connie L. Peters, a 30-year veteran writer, has published hundreds of devotions, short stories, and poems in many publications. She writes from southwest Colorado, where she and her husband host two adults with developmental disabilities. Her two children, now grown, live in Phoenix, Arizona. For days you’ve come to visit. Rain coat, wet boots, fishing rod. dangling feet in the sand. Each day your steps drag deeper. Skin cascades with downcast eyes. For years we’ve been off at dawn. Two friends spending the sun hours. You know only one can row. Take the ores back from your wife. You were kind to that gold child. The fish, prince, dream destroyer. Turn your back and row. NOTE FROM THE AUTHOR: “The Boat Exhorts the Fisherman about His Wife” was my response to a challenge of taking on the voice of an inanimate object. In the Russian Fairytale “The Tale of the Fisherman and the Fish” by Alexander Pushkin, the fisherman catches a golden fish and sets it free. 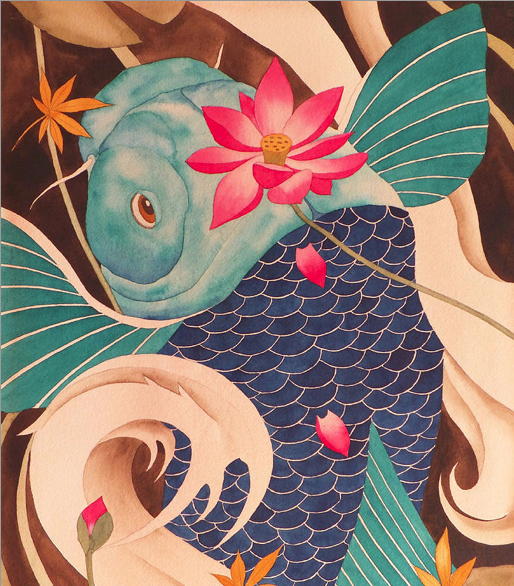 His wife sends him again and again to the fish to ask for a wish, each larger than the one before. With each wish the sea becomes more rough and stormy as the fish is angered by the grandiose wishes. 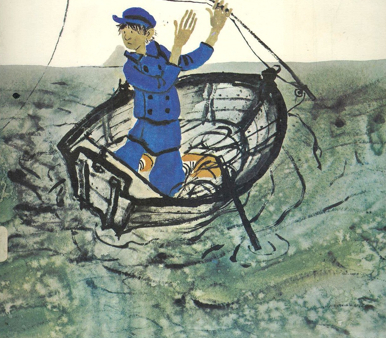 In my poem, every day he has to bring his boat further inland. The sea is no longer safe. Imagine the boat, watching this and seeing this bad situation unfold. Like a good dog, it wants to carry the fisherman safely and enjoy their time. The boat knows the importance of happiness over wealth. Like any good friend, he does his best to help the fisherman see the problem and give him comfort. IMAGE: “The Fisherman and His Wife” by Katrin Brandt (1970). 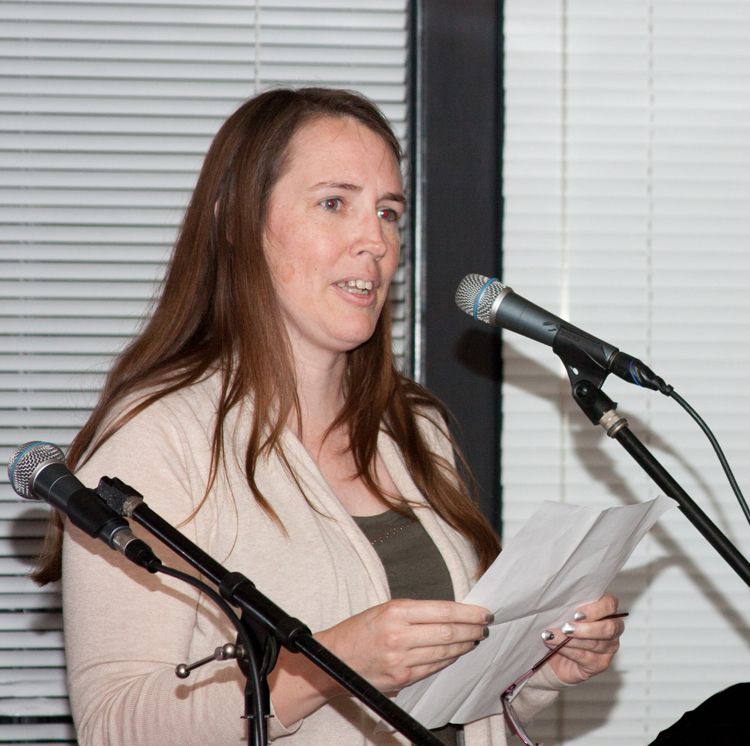 ABOUT THE AUTHOR: Carrie McKay is a poet and teller of tall-tales. A convert to the warm So Cal weather, she began writing as a child in Cleveland during those many rainy days. She currently spends her nights harassing children about homework and days holding down a mundane job. Carrie can be found most Wednesday evenings at the Two Idiots Peddling Poetry reading in Orange, California. Her most recent publications can be found in Defenestration and A Poet Is A Poet No Matter How Tall. 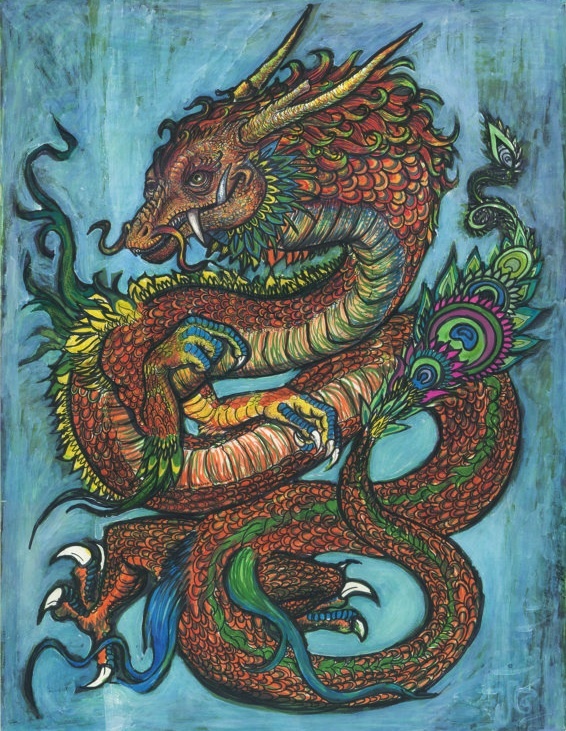 IMAGE: “Water Dragon” by Robert Hooper. 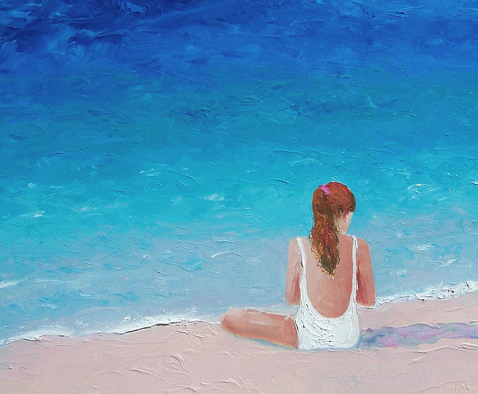 Prints available at fineartamerica.com. ABOUT THE AUTHOR: Rose Swartz is a writer and visual artist from Kalamazoo, Michigan. She currently lives in Portland, Oregon, where she practices darkroom photography and creative writing. She travels frequently. She’s been a poetry editor for Hayden’s Ferry Review and Asylum Lake Magazine. Her writing has most recently appeared in Carnival Magazine, Really System Magazine, and Coal Hill Review. Her chapbook, All Along the California Coast, came out this year on Diamond Wave Press. One might claim a double victory, or after the Roman Empire’s fall, a reclamation from the slurred “b” and its subsequent reduction. Survival of the rarely heard, of the occipital’s impulse. The oak’s crook performs a similar function. root, weighted in weapons, in Woden, in wood. Not rejection, but acceptance in avoidance. The Japanese homophone, daburu, bears a negative connotation. relation between objects and things. Baudelaire’s alphabet existed without “W,” as does the Italian. The recovery of lost perfection is no longer our aim. When following another, I often remain silent. As in two, as in answer, as in reluctance, reticence. I share two halves: one light, one shadowed, but both of water. Overlapped or barely touching, still we complete. NOTE FROM THE AUTHOR ON HIS CREATIVE PROCESS: One word, followed by another. Revise. Rest. Read. 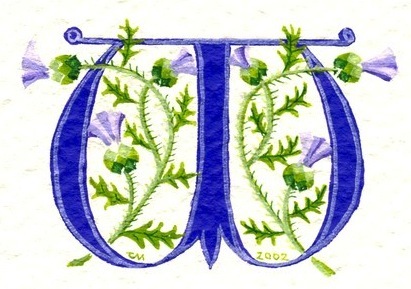 IMAGE: Handpainted manuscript initial letter “W” decorated with thistles by Clare McCrory, available at etsy.com. ABOUT THE AUTHOR: Robert Okaji’s work has appeared in Boston Review, Otoliths, Prime Number Magazine, Clade Song, and Vayavya, among others. He lives in Texas with his wife and two dogs. Visit him at robertokaji.com. rotifers in the bird bath water. SOURCE: “Self-Portrait” by Eric Burke was first published in PoetsArtists and has subsequently been remixed into a whimsical poetry video by Paul Broderick for The Poetry Storehouse. 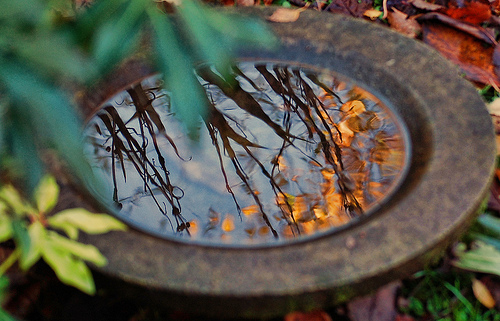 IMAGE: “Bird Bath Reflections” by Delia. ABOUT THE AUTHOR: Eric Burke lives in Columbus, Ohio. 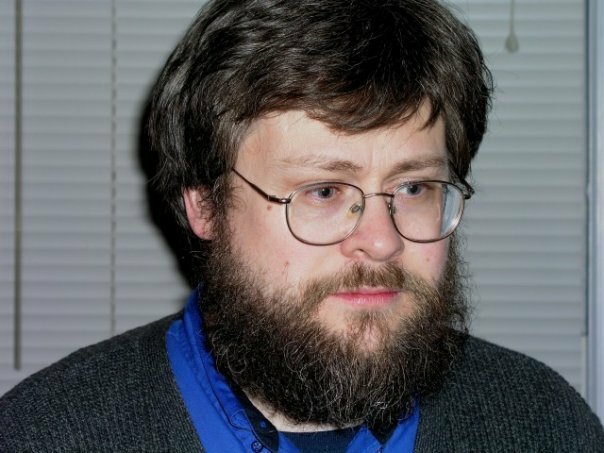 He has an MA in Classics from The Ohio State University, but has worked as a computer programmer for the past 15 years. More of his poems can be found in Thrush Poetry Journal, bluestem, PANK, qarrtsiluni, Escape Into Life, decomP, A cappella Zoo, Weave Magazine, and A Clean, Well-Lighted Place. You can keep up with him at his blog. 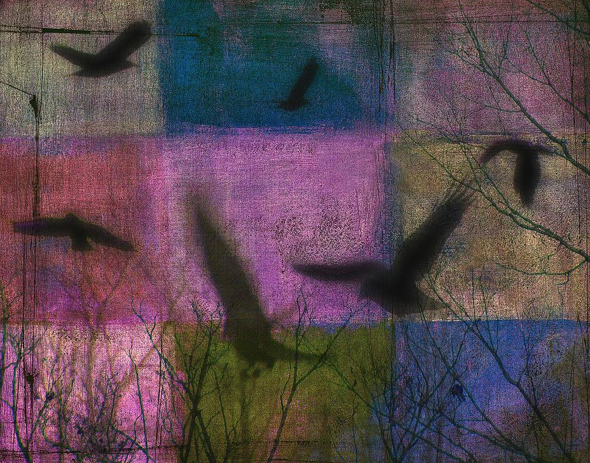 IMAGE: “Patched Quilt” by Gothicolors Images. Prints available at fineartamerica.com. ABOUT THE AUTHOR: Joannie Stangeland’s new poetry collection, In Both Hands, is available from Ravenna Press, which also published Into the Rumored Spring. Joannie’s the author of two poetry chapbooks: Weathered Steps and A Steady Longing for Flight, which won the Floating Bridge Press Chapbook Award. Joannie’s poems have appeared in Valparaiso Poetry Review, Crab Creek Review, Tulane Review, Painted Bride Quarterly, and other publications, as well as in the Rose Alley Press anthologies Limbs of the Pine, Peaks of the Range and Many Trails to the Summit. Her poems have also traveled on Seattle-area buses. Visit her at joanniestangeland.com. A boarded-up house. Ransacked inside — broken glass and toppled tables, chairs overturned, books shaken for hidden money. There are mouths in dreams full of gold teeth, chewing bread and meat. The body is hollow as flame and will burn down anything if pointed straight. A bird flies in through the door, then flutters at the window. Although he is tiny, I am too afraid to help him escape. I’ve made myself another house. I hum to fill its empty rooms. I fold in like saloon doors closing, then swinging out, keeping out thieves. SOURCE: “Self-Portrait at Ten” appears in Roxane Beth Johnson‘s collection Jubilee (Anhinga Press, 2006), available at Amazon.com. 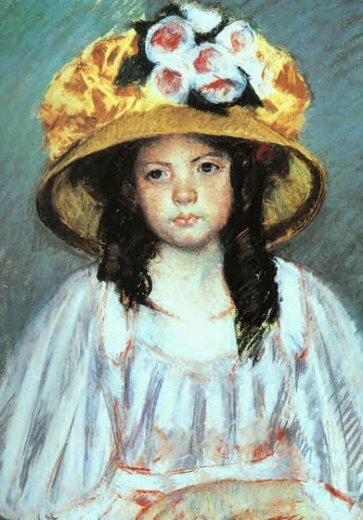 IMAGE: “Girl in a Large Hat” by Mary Cassatt (1908). 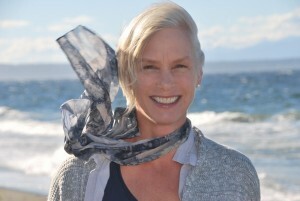 ABOUT THE AUTHOR: Roxane Beth Johnson earned an MFA from San Francisco State University. She is the author of Jubilee (2006), chosen by Philip Levine for the Philip Levine Prize in Poetry from Anhinga Press, and Black Crow Dress (2013). Of African American and Italian heritage, Johnson has said that her early literary influences were the Bible and church hymns; later influences include the poets Anne Sexton, Wallace Stevens, and Rainer Maria Rilke. Johnson has won an AWP Prize in Poetry and a Pushcart Prize, 2007. She has received scholarships/fellowships from The MacDowell Colony, Cave Canem, The Bread Loaf Writers’ Conference and San Francisco Arts Commission. 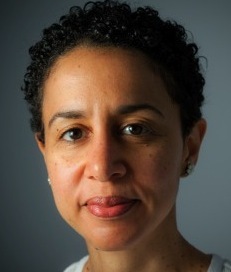 Johnson’s work has appeared in the Georgia Review, Prairie Schooner, Image, Callaloo, Beloit Poetry Journal, ZYZZYVA, Chelsea, and elsewhere.